For many, Europe seems stalled; in jobs, growth and its future space, it seems not so sure on what and where it can effectively compete in a complex and challenging world. There are so many competing voices within, draining vital energy, while others outside Europe are getting on with the job of equipping themselves for the changes taking place to effectively compete in today’s world. The forging of the European Union needs more ‘heat’ to meld into the force that many want, yet every time it seems to be getting to that required temperature for effecting a real change, someone or something comes along and throws ‘cold water’ on it. Perhaps that idiomatic saying of “herding cats” summarizes many of the discussions and debates that often occur all over Europe, offering up their part of the solution to what seems to me, increasingly an intractable problem. There is this ongoing attempt to control or organize what seems intent on staying uncontrollable or chaotic. It just seems incredibly difficult to get the required direction or united determination to channel ‘our’ energies, perhaps impossible is a growing feeling that is fuelling even more the nationalistic pride built from centuries of disputes and disagreements in alternating alliances of the day. Europe in whatever eventual union or collection of entities needs to stop focusing inward as that seems simply not to help. It needs to look outwards and recognize the challenges it needs to go after and organize around, that shift the ground it competes uon, so it can offer the foundations to build from for many of these individual voices to unite to move all those concerns that need clarity, work and a sense of clear direction. We are focusing on the right aspects to unite behind, to identify with and combine our unigue resources. At present we are all pulling in our own directions, to secure our own piece of the declining economic pie and that is undermining any ability for improved performance. You do get this sense we enjoy “crisis and opportunity”. The institutions and bodies that are set up to lay out the broad direction within the EU, start with good intention and then occupy themselves with a host of unimportant or less important matters and neglect priorities during a crisis. They get lost in the details, determined to defend and spend the budgets and lose sight of the need for clear commercial or social outcomes. The source of this “fiddling while Rome burns” is the story that Nero played the fiddle (violin) while Rome burned, during the great fire in AD 64. The flaw in this was there was no such instrument as the fiddle (violin) invented in first century Rome. Equally the events of a fire have been constructed in all the rivalries and conflicting accounts that came after. I get a sense of this today within the EU, we are failing to orchestrate even the violin player, everyone is playing their own tune! It can stay locked up in conflicts, often chaotic decision-making, in its many disputes and simmering rivalries or it can learn from those events across its history and find a different path. I doubt that path is integration of countries, even freedom of movement or common currencies or a given language. These are ideals suffering from imposition yet we can integrate and combine in ways that allow us as individuals to prosper and grow but also to unite in projects and across challenges that deliver a more promising future. Grand challenges we can unite behind. 1. The long drawn out integrating the digital infrastructure across Europe to bring down the present barriers and allow less of a divide across Europe. 2. The ability to connect across a European energy grid that delivers on security, and is moving purposefully towards clean and efficient alternatives that are economically viable alternatives. 5. The overhaul to our educational system to deliver the required skills we need for the future not based on the past. 9. Tackle health and wellbeing in clear, coordinated and integrated ways across all. 10. Redoubling the efforts on food security, sustainable agriculture and land and sea management through a greater agricultural revolution. I could add a few more but these are all ‘big bites’. We should possible go back to the approach to EU flagship programmes where the big agenda gets the required focus from politicians, bureaucrats, business and our institutions, at every level and engaging in meaningful ways with our broader society, then we are achieving more in ‘common cause’ and integration than where we have been heading recently. We should push the EU agenda towards delivering integrated models to offer new value and opportunities, the innovation part, as central to achieving the need for new growth and jobs. These big challenges give us our future, they break down the barriers, they open up our minds to what is the real borders to protect, to push out towards in different ways If we can unlock the barriers and ring fencing on many of these that are the blocks today, we are laying in the foundation for growth and jobs. There is nothing new in this appeal but the speed of change occurring outside Europe requires us to shift internal disputes and channel this energy into resolving the big challenges. Europe needs to shoot for a different moon. Structural issues are longstanding, we are attempting to protect far too much, we are falling to move towards a ‘creative destruction’ where innovation-lead solutions provide the better alternative in growth and challenge We link to these common causes as they benefit the individual, as well as the communities we are in (national, local, scientific, educational etc). I detect some positive movement in seizing some of these outstanding big challenges in the way the European commission is being set up and structured. The new commission structure is pointing to big issues; it is veering away from past integration mantras, wanting to deliver on some of these challenges suggested above. I just hope it does not extend the list too much or we go down the path of dilution, spreading and stretching our capabilities and resources too thin and ending up with the usual past compromises, all wrought out in eleventh hour late night deals. Of course this is perhaps wishful thinking and certainly early days. As we continue to have fiscal consolidation, we get rising Euroscepticism. We nibble away not so much at the edges we are actually attacking our core and this is where we are facing the defence of knowledge assets and finding ways to promote by, perhaps, uniting behind our bigger EU challenges. We need to scale and create the positive waves through innovation. Reality is not in what is going on inside Europe, it is what is happening elsewhere. It is the organization of those knowledge assets to scale and develop the waves of innovation that Asia and America are clustering around in better ways than in Europe. These can be seen in numerous ways as geographical regions all look for ways to become the dominant force for innovation. Asia, especially China is testing that existing dominance and Europe and others in the West need to embrace that challenge, not attempt to defend against it in legislative efforts but in this necessary knowledge asset re-equipping. Innovation features higher in national policy than ever before in many parts of the world. Let us all hope Europe does not drop the innovation ball, but cutting its commitments to what has already been hard fought over, delivered in the Horizon 2020 programme. Equally let’s not dilute its effort and whittle away its value in thousands of small, perhaps meaningless gestures built on political threat and fragmented thinking. Getting Europe moving again will need a much bolder vision and then stay focused on funding it if it links into these grand challenges in clear or valuable (experimental) ways that can be a catalyst for others to pick up and run with over the next mile, as innovation is not a sprint, it is a marathon to run, at this big challenge level. Who is that knocking on my door? * China has set itself some ambitious innovation targets, in its production of patents, in producing more PhD’s in science and engineering than US institutions or European ones and twice as many undergraduates in these fields than the US. * China is going about outpacing the US in investments in research and development, it is growing R&D expenditure by 15 to 20% per year, not just to catch up but to drive innovation into its future. * Asia and America invest more than Europe in R&D at the ratio of 3:3:2. The technology-intensive activity in the Asian region is fast approaching that of North America and Western Europe. * The precise impact of Asia’s IP expansion is impossible to predict. But its transformative potential is obvious as the commissioners of the patent offices of Japan, South Korea, China and, to a lesser extent, Singapore and Taiwan meet increasingly to define and coordinate their intellectual-property (IP) policies although a number of territorial disputes and political divides do often get in the way. 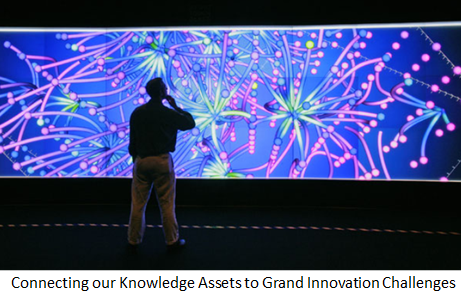 Each of these are examples are building the future knowledge assets to unlock innovation potential. * America equally continues to work through a clearer innovation framework than I feel we in Europe seem not to have, or it seems incapable of delivering in our current fragmented view of innovation understanding. We want to spread innovation either too thinly or distort its value and meaning. We need a clear overarching innovation message. * Take the reports from the “NII Innovate America Council on Competitiveness” or the White House view on “A Strategy for American Innovation” as debate documents or guidance indicators that offer an overarching view of how innovation needs to work and on what is needed to achieve and maintain a competitive position for America, written by both Business leaders and Government officials. The European Union has consistently failed to exploit its potential for innovation-based growth. Europe remains less inter-connected in critical areas due to political grandstanding and catering to vested domestic interests. Does Europe lack the capacity for change as we constantly fail to convert much that seems promising, we are often not commercializing on all our hard work? Others pick up the baton and make the ‘risk’ investments off of the work and initial investments in Europe. We constantly get caught up in the politics of the day, that seem to continue to divide and rule in old fashion ways, yet technology, science, and innovation are moving at a force and speed we are often guilty of not appreciating its impact or wealth-creating prospective. Innovation does not respect borders, it seemlessly moves across them but we need to forge the infrastructure to allow it to flow in more efficient and effective ways. It is high time we did understand the real value of innovation, it ‘touches’ us all, we can all ‘feed off it’. We need to mobile around innovation and find the right ways to release our knowledge assets that are residing across Europe in a myriad of guises, waiting for the organizing forces and challenges to unite behind and solve. We have the latent capability clearly. **Note : A really useful source of knowledge is this overview of the National Science Board’s Science and Engineering Indicators 2014 highlights some major developments in international and U.S. science and engineering (S&E) that explores many useful indicators in the race of Science, Research and Technology. It’s worth a read. This entry was posted in Molecules and tagged absorbing innovation knowledge, Big Challenges need innovation, Creative destruction, Disruptive forces and innovation, EU and innovation, EU policy on innovation, innovation and societal issues, innovation challenges for adoption, innovation research &development, Roadmap for Innovation resolution, transform europe. Bookmark the permalink.